1 Resident, Department of Dermatology, Mahatma Gandhi Medical College & Hospital, Jaipur. 2 Senior Professor, Department of Dermatology, Mahatma Gandhi Medical College & Hospital, Jaipur. 3 Assistant Professor, Department of Dermatology, Mahatma Gandhi Medical College & Hospital, Jaipur. PG Resident, Department of Dermatology, Mahatma Gandhi Medical College & Hospital, Jaipur. Lichen planus is a chronic inflammatory dermatosis with various morphological pattern. 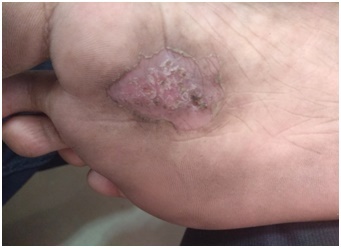 Palmoplantar lichen planus is an uncommon variant which lack the typical clinical characteristic of Lichen planus which make it difficult to diagnose. We report a case of single unilateral hyperkeratotic plaque on the right sole as the only manifestation of Lichen Planus which to our best knowledge has not been reported before .